Visit Rauhaniemi Beach and Riihiniemen Uimaranta for some beach relaxation. see Sarkanniemi Theme Park. There's lots more to do: tour the pleasant surroundings at Pyynikki Park and Observation Tower, test your team's savvy at popular escape rooms, examine the collection at Vapriikin Museokeskus, and take in panoramic vistas at Nasinneula Tower. To see traveler tips, reviews, photos, and more tourist information, use the Tampere travel planning app . Alicante, Spain to Tampere is an approximately 9-hour combination of flight and train. You can also fly; or drive. The time zone difference moving from Central European Time (CET) to Eastern European Time (EET) is 1 hour. Prepare for colder weather when traveling from Alicante in October: high temperatures in Tampere hover around 8°C and lows are around 0°C. 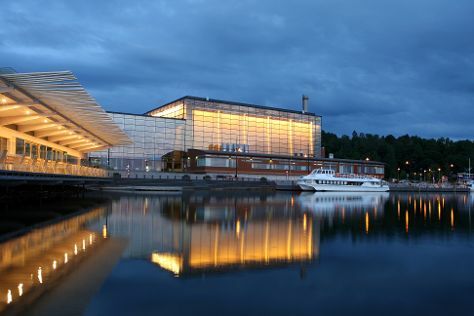 Wrap up your sightseeing on the 10th (Thu) to allow time to take a train to Kuopio. Kuopio is a city and a municipality located in the region of Northern Savonia, Finland. On the 11th (Fri), test your team's savvy at popular escape rooms, get a sense of history and politics at Kuopio Market City Hall, then stop by Pikku Pietarin Torikuja, then browse the different shops at Matkus Shopping Center, and finally enjoy breathtaking views from Puijo Tower. To find reviews, photos, maps, and other tourist information, read our Kuopio trip planner . Getting from Tampere to Kuopio by train takes about 3.5 hours. Other options: drive; or do a combination of train and flight. In October, daily temperatures in Kuopio can reach 7°C, while at night they dip to 1°C. Finish your sightseeing early on the 11th (Fri) to allow enough time to travel to Lahti. Lahti is a city and municipality in Finland.Lahti is the capital of the Päijänne Tavastia region. On the 12th (Sat), admire the local landmark of Musical Fountain, examine the collection at Motorcycle Museum of Finland, and then get into the urban bustle at Sibelius Hall. Getting from Kuopio to Lahti by combination of flight and train takes about 3.5 hours. Other options: drive; or take a train. Expect a daytime high around 8°C in October, and nighttime lows around 1°C. Wrap up your sightseeing on the 12th (Sat) to allow time to travel back home.